Green infrastructure is a cost-effective and resilient approach to our water infrastructure needs that provides many community benefits. 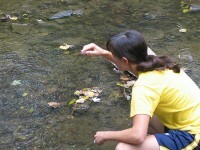 Water Quality: Stormwater from urban areas delivers many pollutants to our streams, lakes, and beaches - including pathogens, nutrients, sediment, and heavy metals. In cities with combined sewer systems, high stormwater flows can also send untreated sewage into our waters. By retaining rainfall from small storms, green infrastructure reduces stormwater discharges. Lower discharge volumes translate into reduced combined sewer overflows and lower pollutant loads. 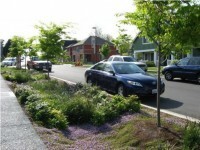 Green infrastructure also treats stormwater that is not retained. Flooding: Conventional stormwater infrastructure quickly drains stormwater to rivers and streams, increasing peak flows and flood risk. Green infrastructure can mitigate flood risk by slowing and reducing stormwater discharges. Water supply: Rainwater harvesting and infiltration-based practices increase the efficiency of our water supply system. Water collected in rainwater harvesting systems can be used for outdoor irrigation and some indoor uses and can significantly reduce municipal water use. Water infiltrated into the soil can recharge groundwater, an important source of water in the United States. Private and Public Cost Savings: When stormwater management systems are based on green infrastructure rather than gray infrastructure, developers often experience lower capital costs. These savings derive from lower costs for site grading, paving, and landscaping, and smaller or eliminated piping and detention facilities. In cities with combined sewer systems, green infrastructure controls may cost less than conventional controls, and green-gray approaches can reduce public expenditures on stormwater infrastructure. Ground Level Ozone: Ground level ozone or smog, is created when nitrogen oxides (NOx) and volatile organic compounds (VOCs) interact in the presence of heat and sunlight. Smog conditions are usually worst in the summer and can lead to respiratory health problems. Vegetation can reduce ground level ozone by reducing air temperatures, reducing power plant emissions associated with air conditioning, and removing air pollutants. Particulate Pollution: Particulate matter refers to the tiny bits of dust, chemicals, and metals suspended in the air we breathe. Because particulate matter is so small, it can enter into the lungs and cause serious health effects. Trees, parks, and other green infrastructure features can reduce particulate pollution by absorbing and filtering particulate matter. Health Effects: Breathing ground level ozone and particulate pollution can cause respiratory ailments including chest pain, coughing, aggravation of asthma, and even premature death. In their triple bottom line study on the benefits of green infrastructure, the City of Philadelphia found that increased tree canopy would reduce ozone and particulate pollution levels enough to significantly reduce mortality, hospital admissions, and work loss days. Urban Heat Island: Urban heat islands form as cities replace natural land cover with dense concentrations of pavement, buildings, and other surfaces that absorb and retain heat. Trees, green roofs, and other green infrastructure features can cool urban areas by shading building surfaces, deflecting radiation from the sun, and releasing moisture into the atmosphere. Energy Use: By reducing local temperatures and shading building surfaces, green infrastructure lessens the cooling and heating demand for buildings, reducing energy needs and decreasing emissions from power plants. Climate Change: As different parts of the country become drier, wetter, or hotter, green infrastructure can help communities adapt to climate change by increasing the capacity of drainage systems to handle large storms, increasing the resilience of water supply systems in times of drought, and mitigating the urban heat island effect. Urban vegetation can also mitigate climate change by reducing the levels of greenhouse gases in the atmosphere. Water/Energy Nexus: Treating and moving drinking water and wastewater takes a lot of energy. By reducing stormwater inflow into sewer systems, recharging aquifers, and conserving water, green infrastructure can significantly reduce energy use. Habitat Improvement: Vegetation in the urban environment provides habitat for birds, mammals, amphibians, reptiles, and insects. Even small patches of vegetation such as green roofs can provide habitat for a variety of insects and birds. By reducing erosion and sedimentation, green infrastructure also improves habitat in small streams and washes. Habitat Connectivity: Large scale green infrastructure, such as parks and urban forests, also help to facilitate wildlife movement and connect wildlife populations between habitats. Learn how Loxahatchee, Florida is protecting the local watershed and conserving native ecosystems through the Loxahatchee Regional Greenways System. Green jobs: Green infrastructure can reduce a community’s infrastructure costs, promote economic growth, and create construction and maintenance jobs. As demand for green infrastructure skills increases, a range of new training and certification programs has emerged. Health Benefits: More green space and parks encourages outdoor physical activity, reducing obesity and preventing associated chronic diseases such as heart disease, high blood pressure, stroke, Type II diabetes, arthritis, and certain kinds of cancer. Recreation space: Green infrastructure’s vegetation and trees can increase publicly available recreation areas, allowing urban communities to enjoy greenery without leaving the city. Additionally, green infrastructure’s vegetation and permeable pavements can reduce noise pollution by damping traffic, train, or plane noise.